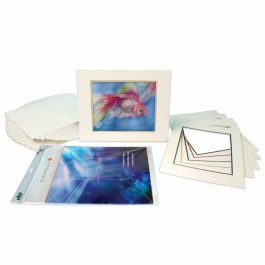 ClearBags® 11" x 14" Crescent® Mat Show Kit includes everything you need to display 8 1/2" x 11" artwork. Kit includes: • 25 Acid Free Crystal Clear Bags® • 25 Crescent® Conservation Grade Pre-Cut Mats • 25 Backing or Foam Boards Mounting accessories and photo paper optional. Some assembly required. ClearBags® 11" x 14" Crescent® Mat Show Kit includes everything you need to display 8 1/2" x 11" artwork. • 25 Crescent® Conservation Grade Pre-Cut Mats - Quality buffered– pH Neutral matting. Choice of a single or double mat. Double mats have a 3/16" reveal.